On the final leg of his journey across Russia's volatile North Caucasus, the BBC's Steve Rosenberg reports from Dagestan, just east of war-ravaged Chechnya. 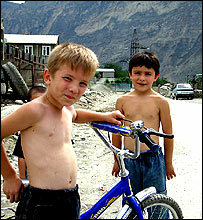 In the mountains of Dagestan, Khaibulla gave me some advice on how to raise children. I'm glad I'm not his son. "Bringing up children is like bringing up a dog," Khaibulla told me. "Sometimes you need to beat them with a stick to make them behave." I was driving through narrow lanes in the village of Gimri with Khaibulla and his twin sons. Suddenly there was a loud crunch as the van scraped a wall. "You piece of dirt!" Khaibulla exploded at one of his boys. "I couldn't see the wing mirror because of you!" He slapped him round the head. Later, I asked Khaibulla why he was so strict. "Life is tough in the mountains," he explained. "It's a daily battle for survival here. Children must be prepared for that." Life is certainly tough in Gimri. The village is isolated. To get to it you need to drive through a five-kilometre tunnel. For now, most of the villagers have jobs building the hydroelectric power station nearby. But the project is nearly complete and the workers face the prospect of unemployment. Gimri is a tight-knit community. Many of the houses are built on top of each another - their compactness has, for hundreds of years, helped the villagers defend themselves from attack. In Gimri, Islam is central to people's lives. It was here that one of the heroes of the Caucasus was born - the legendary Imam Shamil. Nearly 200 years ago, he managed to unite the mountain peoples in a religious war against Russia. It took the armies of the tsar 25 years to defeat him. Khaibulla took me to the tiny house where Imam Shamil was born. Then he showed me a piece of paper with a complicated diagram and some Arabic writing. "This is my family tree," he said proudly. "As you can see, I'm a direct descendant of Imam Shamil." 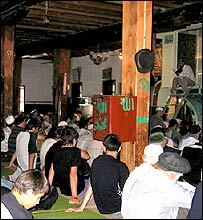 We went to the village mosque at the top of the hill for Friday prayers. It was packed with worshippers. The local imam addressed the congregation on the importance of being good neighbours, and of doing good deeds, not bad. But the Russian authorities view Gimri as a hotbed of radical Islam. In the past, Wahhabi militants have tried to blow up the tunnel. A few months ago, the security forces launched a giant military operation just outside the village. Discovering that up to eight suspected Islamic militants were hiding out in a nearby forest, the military bombarded the woodland with mortars and bullets. The men escaped and slipped back into the village. The authorities are currently negotiating with them to get them to disarm. I was introduced to one member of the group. He complained that whenever Muslims picked up a gun they were labelled "bad guys", but whenever world leaders like US President George Bush or Russia's Vladimir Putin use force, no-one criticises them. Two of the men are nephews of the former imam of Gimri, Mogamed Said. 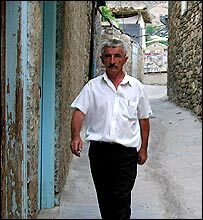 He told me he had tried to introduce Islamic Sharia law in the village but the authorities were furious and forced him to cancel it. "If people try to use force against Islam," Mogamed Said said, "then people here will repeat what Imam Shamil did in the 19th Century." But my guide Khaibulla is certainly no militant. All he wants in life is to be left in peace, to practise his faith and raise his family. "I've promised to buy my daughter a mobile phone if she learns the Koran," Khaibulla told me. "What about the twins?" I asked. "Oh, I've already bought them bicycles," Khaibulla replied, "as a reward for good behaviour". Then he pulled a face. "Trouble is, as soon as they got the bikes, they stopped behaving themselves!" Khaibulla sighed. "It's hard enough bringing up one child. But just think what it's like for me, with seven!"